New work has been photographed! Last weekend photographer/friend David Cummings and I spent the afternoon taking photos of 10 new sculptures which will be part of the upcoming ‘Carving at a Glacial Pace’ exhibition at Dock Gallery in Rotterdam, Netherlands opening September 4th. Also if you live in the Southeastern part of the United States please do not miss your opportunity to enjoy these works of art before they are shipped to Europe. Comments : Comments Off on New work has been photographed! The Big Wills Arts Council presents the artwork of Mark Leputa. Glass artist Mark Leputa’s work has taken him all over the world. He’s shown his sculptures in places such as Florida, Texas, Colorado, Wyoming and the Netherlands. It’s these and other travels that have inspired his new Glacial Series, which will soon take him back to the Netherlands this September for another solo exhibiton. The Big Wills Art Council would like to invite you to a preview Mark’s exhibition artwork before it leaves the US. Also on display will be the photography of David & Lesa Cummings of Anniston, Alabama, whose photographs were often referenced for Mark’s glacial sculptures. Join us at the artist reception for food, drinks and a presentation by Mark Leputa on Friday, July 29th from 6 – 9pm. *The work will also be on display Saturday, July 30th and Sunday, July 31st from 12 – 3pm. As many of you know for the past year I have been diligently creating new artwork for my second solo exhibition in Europe. This show will be opening at Dock Gallery in Rotterdam, Netherlands on September 4th. The ‘Glacial Series’ to be featured is based on mountainous environments and the glaciers that create them, which have peaked my interest for years. Through climbing and mountaineering, I get to experience these wild places, which in turn not only influence my artwork, but also my entire being. Just as the glaciers have shaped the landscapes, so too have they shaped my identity, passion, principals, and personal beliefs. In my opinion these sculptures are some of my best and most personal. The process of creating and experimenting with this ‘Glacial Series’ has been fun and enlightening. Below is an update on the progress of some of the work. More working photos can be found in a previous post. Some of my closest workmates.- these diamond wheels are used to grind and cut patterns into the surface of the glass once it is cold. These cups must be picked up and treated very carefully in order to keep from trapping unwanted air bubbles. A large glacial lake is now completed in the hotshop. It much cool down very slowly in the kiln. Once room temperature it can be cut and carved into its final form. On the left is an unfinished serac mapped out for grinding. The white surface will be cut through in order to reveal the underlying blue glass. Once the forms are cold they will be shaped into their final form through cutting and grinding. Here is a stuffed-cup which was cameo engraved to create a pattern. Building an ice cave takes both skills learned in preschool as well as profession skill. Gluing is much less labor intensive than other forms of coldworking. Cleaning up an object after polished the lenses. Rarely are the sculptures I create completed in one sitting. Many of them take multiple stages until they are completed. Below you will see the start of one of the graal stuffed cups. They begin as two bubbles in which they are joined together. One bubble is turned inside out onto the other thus allowing the surface to have the color. (Normally the color is the inside skin of a blown vessel.) The technique used below is referred to as Swedish overlay. It takes precision heating and turning along with a good assistant to shield you from the heat. After this overlay is completed the remaining bubble is blown into a large cup shape to later be carved and heated up. In the previous post you can see how the cup is carved using various diamond engraving wheels and a lathe. Stay tuned for what happens next…. I posted a new video on YouTube showing part of the process of creating some of my new sculpture. These new works will be featured in my upcoming solo exhibition in Rotterdam, Netherlands at Dock Gallery on September 4th. 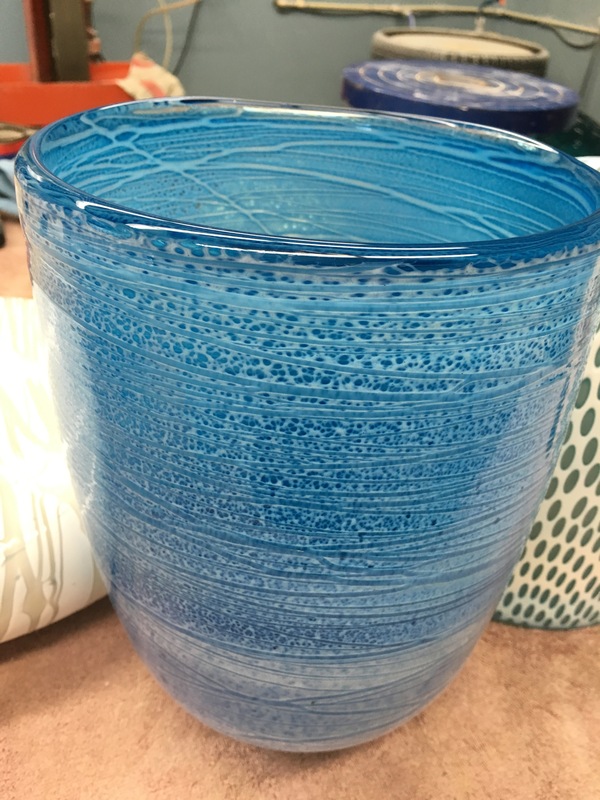 This cup will become the outside layer of a larger sculpture. 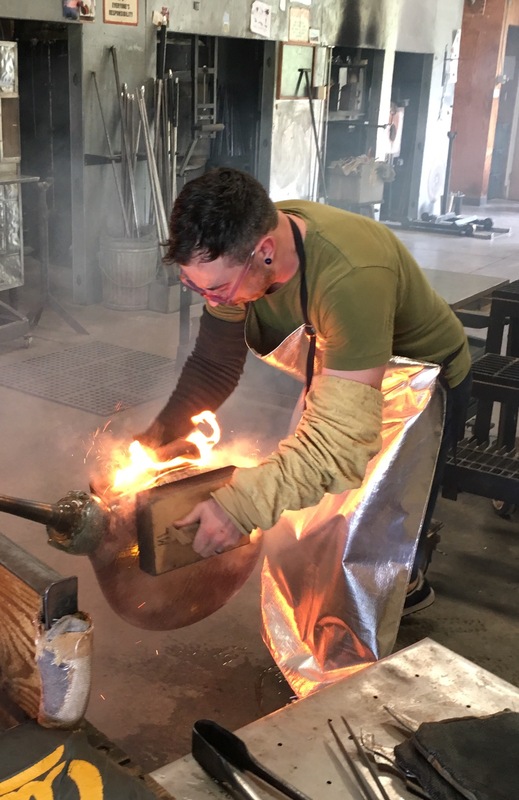 Once the engraving is completed this cup will be heated up to 1050*F. Then a larger amount of molten glass will be plunged into it to pick it up. 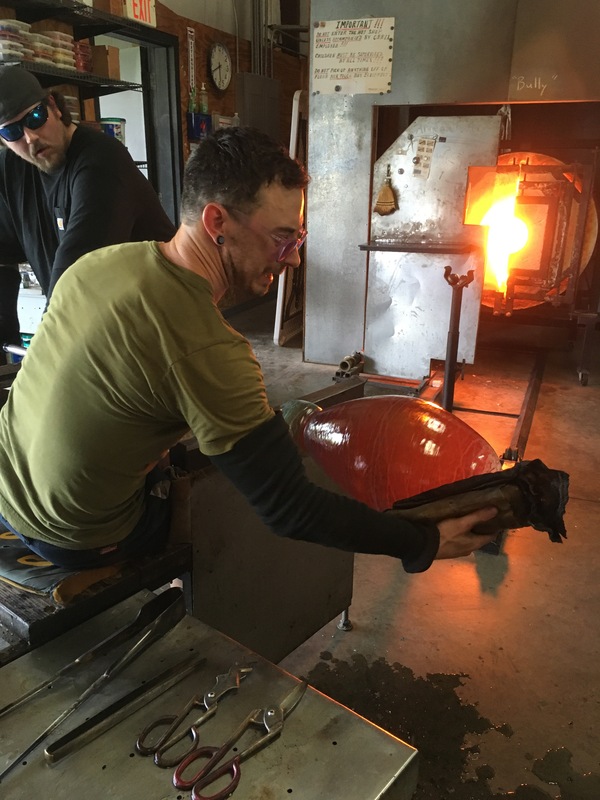 The glass is then heated and blown it into its final shape. Celebrate your Friday! Here is a quick interview I did with Fusion Art Glass Galleries. I first want apologize to anyone who regularly checks this website hoping for updates. I’m much slower to post on here than on social media websites like Facebook and Instagram, both of which I update regularly. Please follow me on Facebook at Mark Leputa Glass Sculpture and on Instagram @markleputaglass. For those of you who choose not to use those sites, what I hope to manage today is to bring you up to speed on the past few months. My biggest news is Dock Gallery in Rotterdam, Netherlands will be hosting my second Dutch solo exhibition, which has yet to be titled. The opening will be held on September 4th. The work for this show is centered around Glaciers and my relationship with the mountains. The Glacial Series was merely touched upon in 2013 and for this show I am focusing on this theme. So far, the work has been emerging beyond expectations, and I feel this is some of my most interesting sculptures to date. It will be exciting to see this series together in September. Victoria and I hope to see you at Dock Gallery on September 4th. For more information please visit the Dock Gallery website. Below are some photos and videos of the exhibition’s progress and inspirations. Carving the edge of this sculpture. Some of these sculptures are my largest to date. This particular one didn’t make it as the weight of it broke the largest blowpipe on the market. How air is whipped into the glass to create bubbles. Details of the surface. Peering into ice. Bubbles trapped deep under the ice. Removing some color to create floating icebergs near the rim. Comments : Comments Off on Updated. Not outdated.